Our new Benchtop Tank is designed for the hobbyist, with an easy to use system that utilizes a foot pedal to operate. Great for all your taxidermy and gun stock hydrographic printing needs. As with all of our tanks, it is manufactured in the United States, with a 14 gauged, all 304 stainless steel construction and tig welded joints. Our Benchtop tank is a 120 volt unit that comes with a nice watt low heater with an Inconel element, and an efficient internal pump that makes for a nice clean tank. Order yours today. Our two day training class will go over the foundations of water transfer printing to get you up and started on the right foot! PA Hydrographics offers a range of water transfer printing tanks to cater to your individual needs. Our tanks are equipped with a high efficiency pump that includes a stainless steel impeller. The “UL” electric control panel is fitted with the highest quality components, all of which are Allen Bradley. We build only tanks of this caliber, guaranteed. Compare us with other tank builders, you will not find a better tank! You will not find a better hydrographic tank! PA Hydrographics is a family business based out of Erie PA. We strive for excellence and take pride in our products. Get smart with our smart panels! We are now offering a high tech “smart” panel product as our cutting edge hydrographic panel. Each smart panel contains a Rockwell PLC (Programmable Logic Controller) which allows for sophisticated responsiveness and control. We DARE you to compare us to our competition. PA Hydrographics is a family business based out of Erie PA. We strive for excellence and are committed to using only state of the art techniques. Our hydrographic tanks are constructed out of 14 gauge 304 stainless steel and our tanks are tig welded together to provide you with the cleanest and strongest tank available on the market. - Pretty much any pattern you can come up with! Hydrographic Printing is also known as immersion printing, water transfer printing/imaging, cubic printing and hydro dipping. Hydrographics is an extremely versatile method for placing a complex graphic on items of any size and shape. Hydrographic printing is ideal for putting graphics on rims, automotive parts, guns, skateboards, and other sporting equipment. 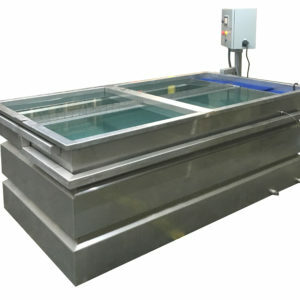 We not only manufacture hydrographic tanks, but supply hydrographic film, hydrographic supplies, hydrographic prints and graphics, and everything that goes along with this process. All of our control panels are built from a Nema enclosure that uses the best components in the industry. Our tanks feature a high efficiency pump with a stainless steel impeller. Everything from wiring the panels to cutting out the stainless steel with our in-house laser at our on-site facility and all are panels are bent using a CNC bender. We provide the best prices on the market because we build the entire tank in-house. "Bought my tank from PA Hydrographics last year. This tank has worked flawlessly. The welds are top notch and have never had a leak from anywhere on the tank. Any question I have had, Jake has answered my question as soon as possible, and even offered to come down to my location 45 minutes away to run me through everything. The customer service is top notch and everything being American made is a great bonus. I would recommend PA Hydrographics to anyone in the hydrographics business, whether they are starting out or a veteran." "When we were looking at adding multiple tanks to our ever expanding hydrographics business we looked no further than PA Hydrographics. We were very specific in what we needed in a tank having been in business for years. Jake listened to our needs and built us what we wanted. Its used daily and outperforms all our other tanks. I would highly recommend Jake and PA Hydrographics for your tank build." "Purchased a 10-ft tank from PA Hydrographics recently and had it shipped across country. Received tank quickly and was provided with excellent customer service in helping answer all questions regarding setup. Tank works great! Later flew to PA for a training weekend - well worth the extra investment! Jake has been available to help us with our many questions as we start up our new hydrographic printing company. Highly recommend. We have also ordered several Iwata spray guns from this company and got a great deal. We did quite a bit of research when we were trying to decide who to purchase a tank from. Ultimately PA Hydrographics won out - American made, easy to obtain parts, professional welds on high quality stainless steel, and top notch components...all for a price that fell within our budget." "Got a tank from the guys from Pa Hydrographics. The entire experience was great. Jake trained us on the basics of the buisness and was very helpful answering all the questions I had. The tank is of great quality and has performed flawlessly as we work to grow our company. I would recommend Pa Hydrographics to anyone looking for a quality product and great people to work with." We Make Custom Hydrographic Tank Panels! We are the only company which is UL listed for panels and the quality of our product is undeniable. Each and every one of our panels uses the highest quality Allen Bradley components, from pid to the timer to the circuit breakers. Our panels are built to Industrial standards and are the only hydrographic control panels which have a UL safety rating. Each of our standard UL heater panels are equipped with an automated timer signal to notify when dipping may safely begin. In addition, each of our panels is equipped with a Rockwell temperature controller which maintains the temperature of the water in the tank. We are now offering a high tech "smart" panel product as our cutting edge hydrographic panel. Each smart panel contains a Rockwell PLC (Programmable Logic Controller) which allows for sophisticated responsiveness and control. Some features only found in our smart panels include: touch screen HMI, adjustable timer settings, adjustable temperature settings, programmable to signal tank operator "next step" operations, programmable selector buttons on the HMI to allow the operator to turn the device on or off. Our smart panels also contain a cell modem which has the ability to communicate with mobile text devices!